Every year, the reinsurance conference in Monte Carlo is accompanied by market analysis from key industry observers that sets the agenda for the next year. Here is our round up of what was said. 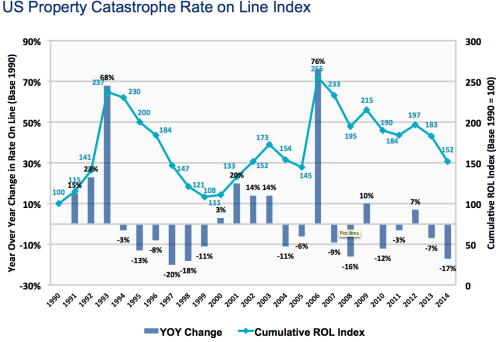 Reinsurance broker, Guy Carpenter, estimates that the alternative reinsurance segment has doubled its market share of the global property catastrophe reinsurance market from 8% in 2008 to 16% today. With US cat rates set to decline again in 2015 and negative outlooks from all four rating agencies, the road ahead is far from smooth. At mid-year, global reinsurer capital hit a record high of $570 billion, up six percent in just six months. Around $59 billion of this is alternative capital, according to Aon Benfield, with 70% focused on US catastrophe risk. The “weakening fundamentals” of the sector include high levels of competition, exacerbated by the influx of third-party capital and low catastrophe activity, poor investment returns and drying up of prior-year reserves (traditionally used to bolster a disappointing underwriting performance). The predicted deterioration in reinsurer results could occur as soon as next year, thinks Fitch Ratings’ senior director Martyn Street. Much depends on loss activity in the coming months.